Forget about the Roast Beef – look to the sea for a great Sunday Lunch in Cardiff. Sunday Lunch at Fish At 85. Back in my early days of Twitter I’d fire up the software and scroll back through my timeline to catch up on what had happened that day. Of course, then, Twitter was far less popular and I followed far fewer people. These days, when I check in I can hardly keep up with my timeline going forward let alone backward. So it was very fortuitous that I opened Twitter up in the middle of an interesting conversation that had just started. Interesting enough to make me scroll back through my timeline to pick up the start. 2) 3 Courses for under £20. A table for two was secured very quickly. MrsA chose the Gower Coast Moules Mariniere whilst I went for the Pan Fried Scallops, Sautéed Chorizo & Bell Peppers, Tomato and Chilli Jam. 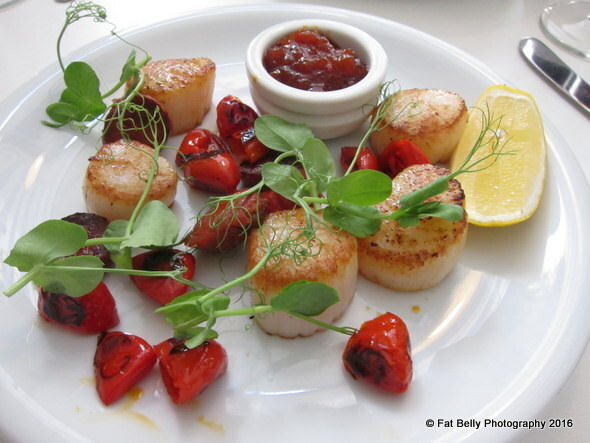 Pan Fried Scallops, Sautéed Chorizo & Bell Peppers, Tomato and Chilli Jam. The Scallops were plentiful, sweet and cooked to perfection. The Chorizo and Bell Peppers brought a nice heat that was balanced by the sweetness of the Jam. 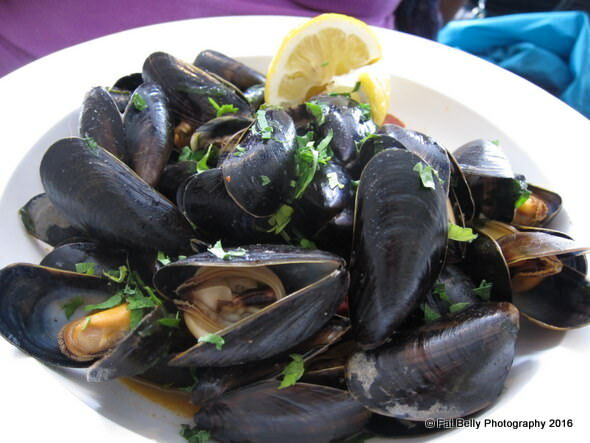 MrsA really enjoyed the Moules and appreciated that she was able to swap the cream sauce for a Chorizo based one. 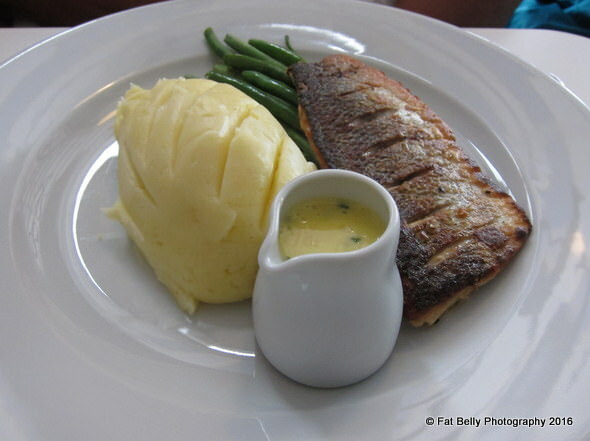 For Mains MrsA had Pan Fried Gower Coast Wild Seabass Fillet, Mash Potatoes, Fine Beans, Chive butter sauce whilst I had Baked Hake Fillet, Sautéed Potatoes & Samphire, Sauce Veirge. 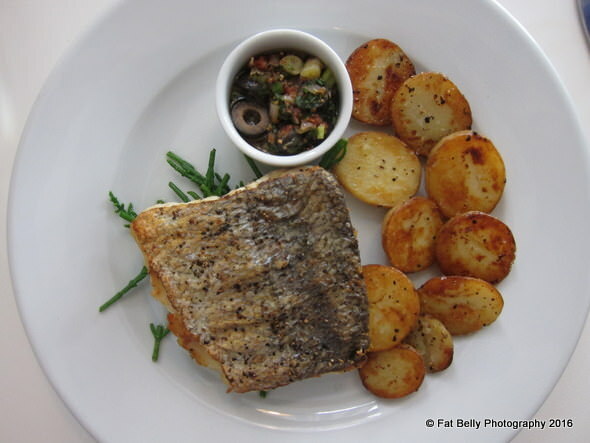 The Wild Seabass was excellent, with lovely fresh flavour. The mash was smooth and rich. The beans cooked with just the right amount of crunch. My Hake was firm and meaty, but retaining that flakiness texture that I love. It’s easy to overcook most fish, and hake is no exception. Fortunately this one was perfect. Although it is quite a mild fish it does stand up to strong flavours very well and the balance of accompaniments here allowed it to show both sides of its nature. 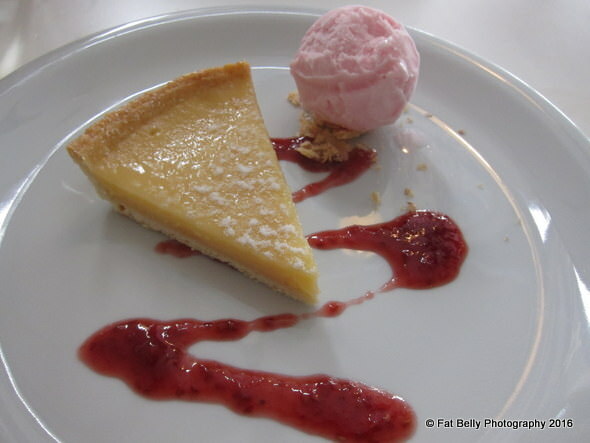 MrsA skipped dessert but I was tempted by a Tarte Aux Citron with a Raspberry Sorbet. I’ve written before about how much I hate ‘hint of lemon’ so I did say ‘If it doesn’t have a real hit of lemon then bring me something else’. They didn’t and I’m not complaining! At £15.95 for two courses and £19.95 for three, this must surely be one of the best value Sunday lunches in Cardiff. Tear yourself away from the Roast Beef and Yorkshires and treat yourself to some superb fish dishes.